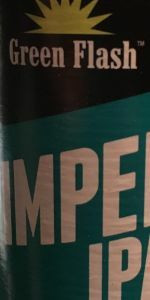 Green Flash Imperial India Pale Ale | Green Flash Brewing Co.
he mountains of Summit and Nugget hops in this high gravity Imperial will thrill even the most experienced beer explorer. Savory evergreen and pineapple aromas mingle with flavors of bitter, resinous pine and grapefruit pith. A colossal rush of hoppy adventure! Pours a cloudy bright orange with yellow tinge. Bubbly 1 finger head of white sea foam. Intense lacing with bubbles around the rim. Smells of grapefruit and tropical fruits with sweet sticky malt and pine. touch of lime peel. complex aroma with a touch of dry biscuit. Nice mouth feel and balance between sweet caramel malts and piney tropical fruit hops. Grapefruit juice with creamy malts and pineapple. Finishes on grapefruit and pine resign hop bitter with a touch of lime peel. Very nicely balanced and not overdone without even a hint of alcohol, impressive for 9.4% ABV. Finishes nicely sharp and dry. Brewed with Summit and Nugget hops to measure up to 101 IBUs, not 100 or 102, but 101. Not that it matters because the taste threshold for most people is about 80 IBUs. Three fingers of off-white head hold strong with a very impressive display of lacing down the glass. Clear brassy color. Smells of tangerines, crushed hemp seeds, fresh mint, black pepper, evergreen, ruby-red grapefruit and wildflowers from the hops; with some ripe passion fruit and pineapple juice from the alcohol. Slight bready tone in the nose but mild compared to the hops. Creamy up front with a slow rolling smoothness in the back. Hop bitterness nearly strangles the life out of our taste buds. After things settle down, flavors of faint white peppercorn, dried grass and pungent citric rind. Maltiness is there but more as the foundation to the full body, what biscuity flavors are present are blanketed by the massive hop presence. Alcohol is deceiving, it is warming but it does not come across as 9.0 percent ABV. The finish is a long, drawn out ramble of hop flavor and bitterness that leans to the dry side. Excessively hopped with just enough malt to get by. Without a doubt, this beer goes down the righteous path to Imperial IPA and is a trophy beer for any veteran hophead. Picked this one at the local grocer the other day. No bottled on date on this bomber. Poured right from the fridge into a pint glass. L: Pours a nice orange blossom honey/amber color with a half-inch of off-white head that drops to a film but doesn't leave any clearing on the surface. A little hazy with minimal effervescence. Some decent lacing on the glass as it goes down. S: Apricot in the nose, along with some malt sweetness and a hint of pine/herbal hops. Not a very big bouquet, but it's quite pleasant. T: Caramel malt at the start, with an onrush of big pine and herbal hops following closely after. The middle has more of that piney, earthy and herbal hop flavor, mingling with some clear alcohol and sweeter malts. The back end is very hoppy and bitter, with that warming alcohol riding it out almost to the end. While really delivering the hops, this beer still manages to stay pretty balanced. I would have cut down some of that clear alcohol flavor, but I suppose that reminds you of the big ABV. F: Medium-bodied, well-carbonated, and bright on the palate. This one goes down relatively easy for such a high ABV. No lingering syrupy quality, though the bitter of the hops sticks around for quite a while. O: I really enjoy this DIPA, as I've enjoyed several other offerings from Green Flash. It hits all the right notes--it's very solid for this stye--even if it doesn't completely alter my reality. If you're looking for a very drinkable, sweeter DIPA with a big ABV and plenty of lively hops, this one will suit you nicely. A - Hazy copper, high carbonation, nice head that has some staying power and sticks to the sides. S - Where is the hop aroma a IIPA should have? There is some citrus hops and a little sweet malt, which is good, but it just too muted. T - A little floral hop to start with a light but hearty malt backbone. The citrus comes on late and there is lot of bitter on the finish. Seems a little out of balance, starts off too soft and then comes on too strong at the end. M - Lots of malt in there with some larger sugars still hanging around in there. Nice alcohol warmth, but too much carbonation though for a IIPA. D - This is a good beer, a good representation of an IIPA, but lacked some balance. Overall, this was below average for Green Flash. I don't got a bad one or what, but I had tons of carbonation and this didn't seem to be the case in other reviews. Also just seemed a bit out of balance, not enough aroma, and flavor starts off a bit weak. Will have to sample again and edit review if necessary. Served on tap at Local Option. The appearance is slightly hazy with generous 2 finger head and tons of lacing. The aroma is in your face with tons of piney hops, this enters the territory of spice... Some spruce like character as well a pine sap. Extremely pungent. The taste matches the over the top hop aroma with a huge bitter flavor. Starts slightly sweet with some apricot, this is followed by raw pine and a touch of earthiness. The mouth feel is medium with high carbonation. Overall, this is one of the hoppiest beers I've experienced. Very nice. The beer is a nice glowing orange color. I thought it would be a much deeper orange than it is. It has a nice white head on it that is about 1/8 inch thick and sticking around for a while. You can smell this beer as soon as you open it. It is very floral. It smells of bubble gum, grapefruit, and other tropical fruits. It's a very inviting smell. Very upfront hop bitterness that is well balanced by the malt. It does not taste like it's 9.4% and it leaves your mouth very dry with a tingle at the back of the tongue. This is an excellent beer. Deep honeyed pour, off color white head dissipates quickly. Stratospheric lacing on the sides. Aroma a floral blend of tropical fruits. Hop leaf sharpness tingles the nose and sweet rich malt. As an imperial this holds true to character. Stark hop bitterness and malt supporting in harmony. The malt brings much depth to help coat the hop in the mouth. Grapefruit rind numbing on the tongue. Mouthfeel has an oily slickness to it. Medium bodied and a welcomed lingering bitterness throughout. A lot of fantastic IPAs available here (I know, first world problems) and part of me wants to grade this higher. An outstanding IPA that I've been waiting to try. Love what Green Flash is doing! 22 ounce bomber poured into two Chimay goblets. Appearance: Crystal clear copper in color...ideal for an IPA. Poured with a medium head which dissipated in uner 2 minutes. The bear left a light lacing on the glass. Smell: The bottle indicates a unique mix of Summit and Nugget hops. I'm less familiar with the Sumit hops, but a quick look shows they're an extremely high alpha acid hop and likely contribute a good deal of the citrusy notes in the nose of this beer and were used, I suspect, in dry hopping. I use Nugget hops frequently and their piney essence was also present. Little to no malt aroma, but with an imperial IPA from the west coast, I'm not surprised. Taste: A bit surprising, but the piney nature of the Nugget hops shone through more than expected. There's still a fair amount of citrus and grapfruit taste up front and just a touch of menthol/alcohol before the underdone malt backbone kicks in. This beer would benefit from more malt presence and a bit better overall balance. Yes, yes I know...Imperial IPAs are not about balance, but it does need more malt. The bitterness is strong, but it did not ruin my palate. That's a bit surprising since it lists 101 IBUs which is at the high end that most palates can discern. The second goblet (see above) sat a bit longer and as it warmed, the pine essence retreated and gave way to more citrus and a bit more maltiness. An interesting change in the beer, but welcome. In both versions, the itterness is maintained throughout the tasting. It drops off only slightly even with several minutes between sips. Mouthfeel: Lightly carbonated with very small bubbles. Light body, but a slightly syrupy consistency which coats the mouth. Dry finish with a lingering bitterness that barely fades. I didn't note any difference between the colder and warmer versions. Drinkability: Hopheads, rejoice! All others this beer is true to the style. Noone expects this to be a session beer, but drinking anything more than a bomber would likely require some kind of food pairing (spicy Thai?). I'd like to try it again and match against its little brother, the West Coast IPA. Big thanks to sirhc and Zorro for this great brew! Bomber poured into a pint glass. Pours a clear bright orange with a huge fluffy white three finger head. Grabs a hold of the glass extremely well. Takes a while to die down to a nice layer that stays the whole tasting. Wow, smell is pure pine, strong evergreen odor. Honsestly there is nothing else I can smell but I like it. Taste is a whole lotta pine hops that dries out the mouth quickly. Flavor in the end is a very dry/bitter bite. Mouthfeel is medium bodied with a good amount of carbonation. I really did enjoy this DIPA because I'm a hophead, but I would like to see more than just pine dominating the flavor and smell, definitely worth a try though. 22oz bottle poored into an oversized mug. Nice light orange with large slightly off white head that left decent lacing. Nose full of citrus, grapefruit/pineapple and orange rind. Some carmallized malts and a wiff of alcohol with some lingering pine. Surprisingly well malted for 101 ibu's. Supremely bitter throughout especially on the finish. The alcohol warmth hits the face but the flavor is well guarded, and although the bitterness rules the day some overripe pineapple and grapefruit flavors do come through. Good mouth feel that coats the tongue nicely. For all the bitterness this is still fairly drinkable, although all of the promise in the nose is not quite fullfilled in ghe taste because of the overriding bitterness. Appearance – Pours a very hazy orange-amber color with a small half finger white head. The head has a good level of retention, slowly fading over time to leave a light level of foamy lace on the sides of the glass and some patchy foam on the top of the brew. Smell – The aroma is on the sweeter side with a good deal of tropical fruits of mango and tangerine. Mixed with these smells are a little bit of caramel and a bit of breadiness. There is a hoppy smell of a grapefruit and floral nature as well. While all these aromas are very nice there is a very little bit of an astringent aroma mixed within slightly taking away from the niceness of the aroma. Taste - The taste begins sweeter of caramel and tropical fruits with a moderately light bready taste upfront. Mixed with these base flavors of the brew, there is a grapefruit and pine hop flavor that is present upfront. The grapefruit and pine gains strength as the taste advances and is joined by some grassy taste more toward the middle of the taste. Toward the end, the fruity flavor of the brew grow a bit stronger along with a rather strong and bitter pine flavor ramping up to its max accompanied and a little bit of alcohol coming to the tongue. A light earthy flavor joins the pine, grapefruit, and grassy hop tastes to, in the end, leave a nice mix of bitter hop mixed with a sweeter tropical fruit flavor on the tongue. Mouthfeel – The body of the beer is on the slightly creamier and thicker side with a carbonation level that is on the lower side. The lower carbonation and thicker body really accentuate the mix of hop and fruit well all while suiting the abv of the brew making it a slower sipper. Overall – Other than the slightly off nose, this was a very nice imperial IPA. It’s a bit on the sweeter side, but all comes together at the end of the taste to leave a satisfyingly pleasant taste on the tongue. Green Flash Imperial India Pale Ale from Green Flash Brewing Co.